If your vocal room is not sound treated, then this is perfect for you! It helps create perfectly dry vocal recordings. It will greatly reduce ambient noise. Great for use in home studios. 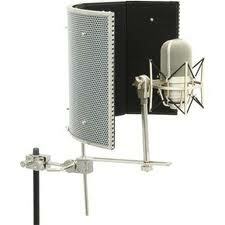 You place it behind the mic and it acts like a wall. It has 6 layers that absorb and diffuse sound waves. This helps cut out reflections off untreated walls and objects that come from the source, which would be your voice or instrument. This will give you a clear recording. You will notice a difference in your recordings. It sells at Guitar Center for around $300. Click the link below for exclusive deals.